The N-Codes are the names or titles of a block of G-Code. In other words, the line number. For more, see our article on g-code program format. Rake is the angle from the workpiece wall to the cutting tool at the cutting edge. If it is 90 degrees, the edge is perpendicular to the workpiece. Angles less than 90 degrees are negative rake angles. Angles greater than 90 degrees are positive rake angles. Positive rake is generally preferable to negative rake because it requires less pressure to cut. Negative rake has the advantage that it provides more edges on a carbide insert (See Also Carbide Insert) that may be used, and may be more economical. NEMA is the National Electronic Manufacturers Association. It is a standard setting group. The relevant standards for CNC purposes include NEMA enclosures, which make suitable enclosures for CNC electronics and the standards for motor mounting, which are what NEMA 23, NEMA 34, and NEMA 42 are. In this case, noise refers to electrical noise. Machine tools are inherently high electrical noise environments. Noise can interfere with the proper operation of controls, so proper care must be taken to avoid it. Shielded cables and proper grounding practices are a good start along these lines. Twisted pairs are another wiring approach to fighting noise. Imagine what could happen if a noise spike caused a false signal such as a step command to a motor, an encoder value, or home or limit switch triggering. Normalizing is a process used to relieve internal stress in a material. There are a variety of procedures used that are dependent on the material. If you machine material that has not been normalized, internal stress may cause that material to warp during or shortly after the machining process. There are methods used to deal with this, but normalizing the material takes care of the problem right up front. NURB is an abbreviation for Non-Uniform Rational B-Spline. This is a mathematical concept used by nearly all CAD software to represent curves. A pre-determined distance entered into and used by the CNC controller. For more, see our chapter on work offsets in our free CNC Programming Course. 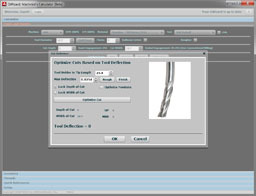 See “Cutter Offsets”, “Cutter Radius Compensation”, “Tool Length Offsets”, “Tool Nose Radius Compensation”, “Tool Offsets”, “Wear Offsets”, “Workshift Offset”, and “Work Offsets”. An Oldham coupler is a type of shaft coupler that incorporates slots sandwiching a middle piece to allow misalignment of the shafts without backlash, similar to a helical beam coupler (See Also Helical Beam Coupler). An open loop system employs no feedback—it assumes the axes always move as they are commanded to without checking. Stepper based systems are usually open loop. When the system doesn’t go where it is commanded to, this is referred to as “Lost Steps”. See also Lost Steps. To get some idea of how closed loop compares to open loop, you may want to visit my Stepper/Servo/Backlash Simulator Page. A limit switch (See Also Limit Switch) that uses an optical sensor, usually based on the principle of breaking a beam of light. If the block contains an M1 code and the Optional Stop control is on, the machine to pause for operator inspection. An Opto Isolator is an electronic component used to provide isolation between two circuits. This is done to promote noise immunity and to protect the circuits from accidental bad connections and electrical surges that might be damaging. For example, if your parallel breakout board didn’t include opto isolators, a voltage surge on the motor driver side could go all the way back through the parallel cable and burn out your PC’s motherboard. The origin is the point at which coordinate values (see also Cartesian Coordinates) are measured. In absolute coordinate systems (see also Absolute), this origin is in a fixed location. In relative or incremental (see also Relative), the origin is usually the current location. Think of it in terms of specifying where you want to go in a room. You could specify relative to a fixed origin, for example, the center of the room, or you could specify relative to where you are standing. Both are convenient, depending on the circumstances. The origin is also the point that defines when coordinate values change their sign. In one direction relative to the origin they will be positive. In the other, they will be negative. The value at the origin is zero. The right-hand rule is a convenient way to determine which directions are positive versus negative. See also Right-Hand Rule. All of the axes or dimensions in a Cartesian coordinate system intersect at the origin. A measurement of torque. See also “Torque”. A facility that allows one or workpieces to be loaded on pallets that are automatically cycled through the CNC machine. A pallet is basically a moveable table. This allows the machine to just keep working uninterrupted as operators load pallets while the machine works with raw material and offload pallets containing the finished parts as they’re completed. The parallel port is one means of connecting a PC to the motor driver electronics. It is a legacy interface that is slowly being phased out of PC’s in favor of USB. It is the most common way to connect a PC running Mach3 to the driver electronics. To make this connection, a breakout board is required that converts the parallel data to individual connections. See Also Breakout Board. depending on which side is viewed. All pins are numbered. – Input: Pin can bring data from machine back to PC, for example status of home or limit switches or encoder pulses. – Output: Pin can bring data from PC out to machine, perhaps to trigger a relay (for coolant or spindle motor control) or to drive a step motor. – Input/Output: Pin can serve as either input or output. In using parallel ports, there are a few things to keep in mind. First, most PC’s only have 1 parallel port (some newer models and especially laptops don’t have any). You can use up to 2 parallel ports with Mach 3 to get more connections, but you’ll need a parallel port card for the second port. Mach 3 gives you a lot of flexibility in how to use the connections provided by a parallel port. Lastly, some newer parallel ports operate at a lower voltage than the originals–about 3.3 volts instead of the normal 5 volts. This can be a problem if all of your components are not expecting the lower voltages. In CNC, the term Parameters generally refers to settings that are made in the machine’s controller outside the part program. Parameters can include many things necessary to tune or configure the machine for proper operation. Examples include the maximum speed an axis can travel or the maximum following error before a servo fault occurs. Parametric drawing refers to a feature of CAD programs that allows the dimensions of the parts to act as parameters. One can change a dimension and the part will adjust its size accordingly. This is very convenient for revising drawings. The feature does not exist in all CAD programs. SolidWorks and Alibre 3D have it, while Rhino 3D does not. Parametric programming is the practice of designing a part program so that it has parameters that may be varied without having to rewrite the program. This is useful, for example, when a single part program is used for families of parts, or when some characteristics of a part must change from time to time on different production runs. Parametric programming tends to be a proprietary feature that differs from one CNC controller to the next. For more, check out our mini-tutorial on CNC G-Code Macro Programming. A part chute is a component of a CNC lathe that provides a convenient way to gather parts as they are sliced off and place them in a bin. What you’d call a G-Code program. Part Program is a more proper and less confusing term than “G-Code” because G-Codes are only one type of word that can appear in a part program. A word that indicates the name of a subprogram to execute. A type of drilling or canned cycle (See Also Canned Cycle) in which the bit is advanced into the hole a short distance and then withdrawn repeatedly to facilitate chip evacuation. Learn more about peck drilling in our chapter on Canned Drilling Cycles. 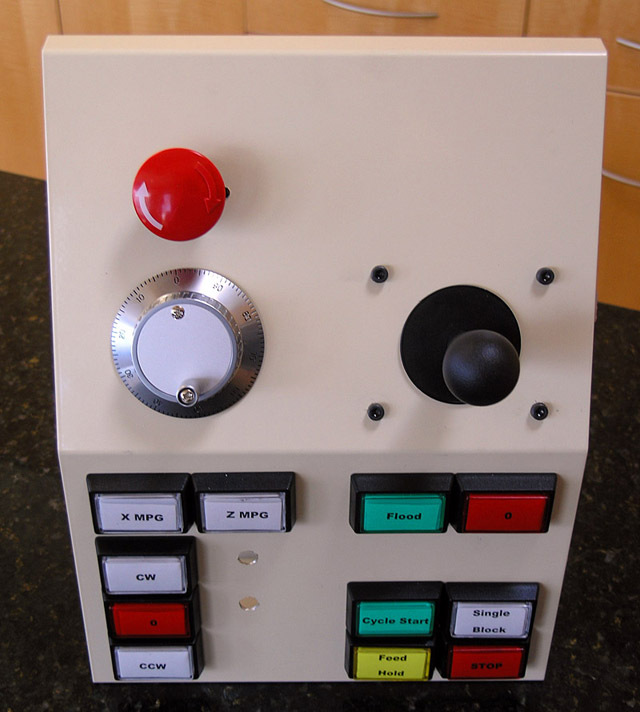 A handheld control for a machine tool. Any milling that uses the edge of the milling cutter that is parallel to the axis of rotation instead of the end of the cutter, as in Face Milling (See Also Face Milling). PID is a type of servo or feedback tuning system which stands for Proportional, Integral, and Derivative. Like Follow Turning, Pinch Turning is a way to employ 2 independent tool turrets on a CNC lathe to cut more quickly. When pinch turning one tool follows behind the other. The first tool cuts a spiral swatch (not unlike threading) and the second tool cleans up the spiral of uncut material left by the first tool. Usually, the number of turns the leadscrew must make to travel a standard distance. For Imperial screws, the standard distance will be an inch and the unit of measure would be TPI or Turns Per Inch. A more accurate and technical definition is the axial distance between threads, which will be equal to the lead in a single start screw. See Also Lead and Screw Starts. A gantry style (See Also Gantry) machine used to move a plasma cutting torch over sheets of metal under CNC control. To cut straight down, similar to drilling with a twist bit. An interior recess that is cut into a part. 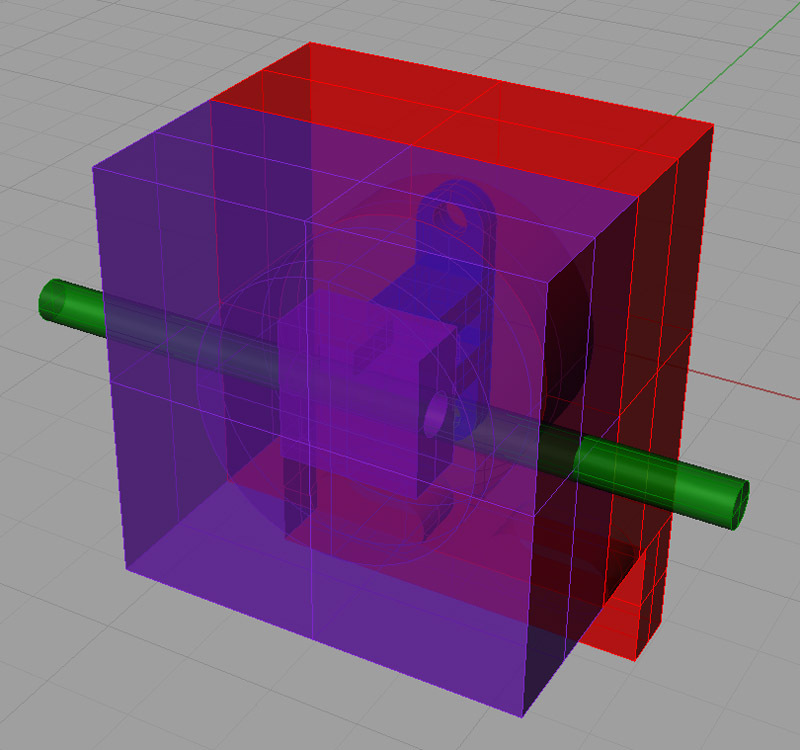 The “Post” is the set of G-Codes or part program generated by the CAM program. The Post Processor is the software component that generates a Post. Post Processors typically tailor the G-Codes to the specific capabilities of a particular CNC machine. power. It’s advantages over a manual drawbar include much faster operation together with more repeatable torque on the drawbar. Preload is a mechanism used to eliminate backlash by tensioning a bearing or leadscrew to take up the slack that causes backlash. Some typically ways in which preload can be achieved include using a threaded screw that is torqued down to create a load, using spacers or shims, using springs, wavy (Belleville) washers, or using oversized balls in a ballnut. As in “blueprint” or drawing. Refers to the drawings that define what the part should be. Once upon a time all prints were “blueprints”, which were made with a photo-chemical process. They smelled strongly of ammonia and were a deep purple blue in color with white lines. This was before laser printers and the like, and the blueprint process was a fast way to copy hand drawn prints of any size. – Dovetail Ways: Very common on mills, dovetail ways look like the dovetails used in wood joinery. – Box Ways: Box Ways are rectangular cross section, as opposed to the angular shape of dovetail ways. Box ways are very strong, but they suffer from two shortcomings. First, they involve a lot of surface contact area, so managing friction is key. Second, in order to slide at all, some clearance is required, which results in some slop in their travel. They are the strongest and most rigid design, but they are difficult and expensive to manufacture. – Prismatic Ways: These are prism shaped ways common to lathes. – Linear Ways: Linear ways use linear slides as rails and so are much different than the other three styles. The roll on ball bearings as opposed to having more metal-to-metal contact in the other designs. Linear ways will have the least rigidity, but for the price, they are ideal for precision and high speeds. A proximity switch is a type of sensor that responds to metal being nearby. They operate on a variety of principles such as capacitance and are commonly used for home and limit switches because they are relatively robust. One issue is that they may be triggered by an errant chip. See also Home and Limit Switch. PTFE is the scientific name for the material whose trademark is Teflon. It stands for Poly Tetra Flouro Ethylene, and is an extremely slippery low friction compound. See also Acetal for machine tool uses. The speed at which signals are being sent over a digital circuit. For example, the number of steps being sent to a stepper motor during a fixed period of time, or the number of steps coming out of an encoder. In systems that use a parallel port to communicate between the PC and the driver electronics, the pulse rate will be limited. Typically the limitation will be somewhere from 20,000 to 45,000 pulses per second, or Hertz. 1 Herz (abbreviated Hz) = 1 pulse per second. This limitation can limit the speed at which you can drive stepper motors, or the amount of resolution from an encoder or spindle index sensor that your system will handle. Higher pulse rates are possible with devices like the GRex that use either the USB port or a LAN connection instead of the PC parallel port. PWM is a technique to vary the average current sent to a device by varying the number (or frequency) of pulses or their duration. Chopper supplies work through PWM. PWM can also be a mechanism used to communicate analog information using a digital circuit. For example, PWM could be used to convert a single output pulse line from a CNC controller to an analog voltage needed to control spindle speed using a VFD.